Bali is famous for its wide variety of relics of sejarahya. There are many stories and events of interest to dug deeper to find out how the area in ancient times. Kertha Gosa is a relic of the past that are still preserved and continue to serve as an interesting tourist attraction. Kertha Gosa is still a part of Klungkung Kingdom in ancient times. Witnessing hundreds – hundred due to built in 1686 during the reign of the first King of Klungkung, Ida I Dewa Agung Jambe. Like most other castles, Klungkung Royal Palace consists of several buildings including Garden Gili or Bale Kambang which is a building that is surrounded by ponds and Kertha Gosa Bale too. Both buildings are located in the northern portion of ruins of the former Royal Palace. Meanwhile, other buildings have been destroyed at the time of the battle against the Netherlands. Kertha Gosa's own term is taken from the Sanskrit words of Kertha which means peaceful or serene setting and Gosa means announced. So from the literally meaning of Kertha Gosa can be diartian as the announcement of Justice that created peace in the Kingdom. Kertha Gosa was indeed used as a traditional court. It is also used by the vassal King of Bali to host meetings and also to welcome important guests of the Kingdom. 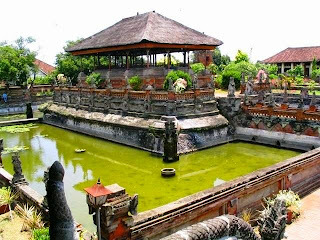 Building – building at Klungkung Palace in general have a traditional Balinese architectural complete with various ornaments such as painting which originated from some areas in Bali as the Kamasan style of painting is the painting of satuu area in Klungkung. Kamasan paintings was mounted on the ceiling of Kertha Gosa sky – bale. In this place there are some chairs and tables like the place of the trial. This proves that this place was once used to prosecute people-people. Kamasan paintings are divided into 9 compartments where each has their philosophy. The first swath of tell Kandika Voila, if in India famous for Tantra or Panca in Europe known as the story of the thousand and one nights. On the second and third compartments, many telling Atma Prasangsa. The fourth lot plot tells the story of Garuda who is searching for Tirtha Amertha. The fifth compartments which tells the sign – the sign of natural disasters or story Palilindon, and so on. As the place of trial, there is a beautiful and ornate detail table with 6 chairs for law enforcers. Chair – seats in part his arm there is a sculpture of a lion is commonly used as a seat of King who became chief judge. The arm chair with carved dragons which is commonly used for the Registrar. Meanwhile, the seats with the bull sculpture was used as a seat of the priest who became an adviser to the King and the pesakitan or the defendant sat down the floor.